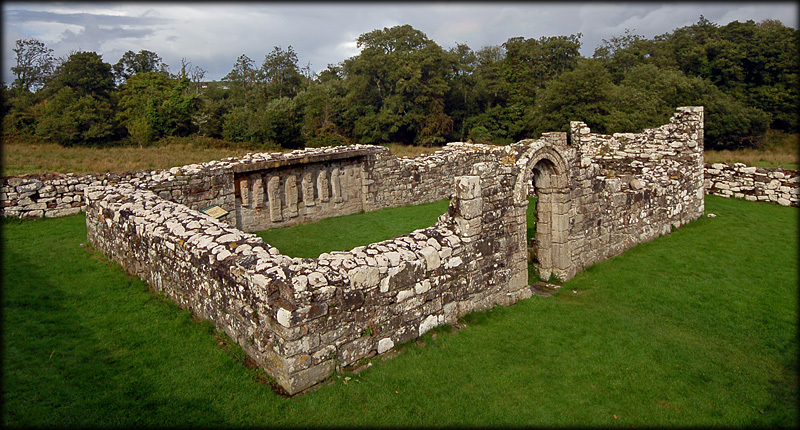 Situated on White Island, Lower Lough Erne, County Fermanagh are the remains of a twelfth century church. 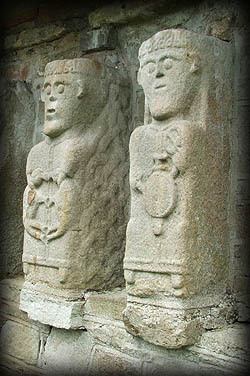 Attached to the north wall of the church are a set of curious stone figures believed to date to around the 9th or 10th century. There are six carved figures and a roughly cut stone ready to be carved which suggests the figures may have been carved on site. To the right of these is a carving of a head (mask) which may be of a later date. The figures are numbered from left to right. It was recently suggested that the figures may represent pilgrims. Whatever the reason for these stone figures they are certainly very impressive. Figure 3 a pilgrim ? Figure 5, detail shown above, shows a man with curly hair grasping two birds in his hands, the decoration at the side represents a high chair. Figure 6, detail shown above, wears a penannular brooch on the left breast and carries a small sword and shield. Figure 1, detail shown below, resembles a sheela-na-gig and may represent lust. Figure 2 carries a small book shrine and could be a missionary. Figure 3, detail shown left, may be that of a cleric or abbot. He wears a hood and carries a crosier and a bell. This figure could also represent a pilgrim carrying his staff and satchel. Figure 4, carrying a small pouch and a short staff, is thought to represent David as Shepherd of Psalmist. 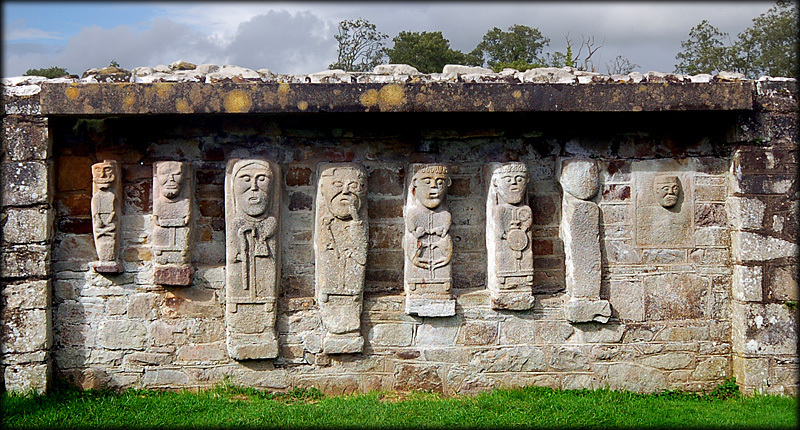 Situated: On White Island, Lower Lough Erne, County Fermanagh. From Fermanagh take the A32 North, then the B82 for Killadeas. Drive North along the Lough until you see a sign-posted turn for Castle Archdale Marina. Take a Ferry from here to White Island. Price £3. The ferry is in service daily during July and August and weekends and bank holidays during April, May and June. I visited in July; the whole trip lasted around one hour. Discovery Map 17: H 1749 6000. Last visit Sept 2010.